You do not need to scale trout. Although trout do have scales they are very small and soft and can be eaten. Place cleaned trout on foil, sprinkle some rock salt over outside of fish, sprinkle lemon pepper, over outside and in the cavity. Slice up some lemon and place inside the cavity. Fold ends of foil in first then roll up sides of foil, this ensures juices from the fish do not escape when cooking. Ensure bbq is hot and place on hotplate. For a 500g fish turn after 5 minutes and cook for a further 5 minutes. For a 1000g fish turn after 10 minutes and cook for a further 10 minutes. Do not overcook trout, the flesh can dry out if left on the bbq too long. After fish is cooked roll back foil and pullback skin from fish using a fork. Use a fork to slowly pry flesh from bones, try leaving the bones in place. When one side has been eaten grab tail and slowly pull skeleton out. Then you should be able to eat the second side with no bones in it. The skin can be eaten as well. Prepare as above. Set oven at 200 degrees and bake in foil for approximately 12 minutes (500g) or 16 minutes (1000g). Again do not over cook fish or the flesh will dry out. Omega 3 is an essential part of our diet and reduced Omega-3 has been linked to a number of health problems including heart disease, rheumatoid arthritis, depression, schizophenia, altzeimers and infant development. Authorities suggest we should all be eating at least one to two portions of fish a week - one of which should be an oil rich fish such as trout or salmon to boost our levels of Omega-3 fatty acids. A weekly intake of 1.5g a week is advised. An average portion of grilled trout (flesh only) is 155g, which provides 1.838g of Omega-3. 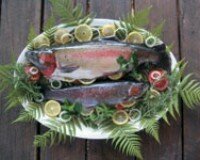 If you have any simple trout or Salmon recipes, please email them to us and we will post them on the website.